Library image #1950: The peaks of Mt. Sneffels Wilderness. The United States Congress designated the Mount Sneffels Wilderness (map) in 1980 and it now has a total of 16,485 acres. All of this wilderness is located in Colorado and is managed by the Forest Service. The United States Congress designated the Mount Sneffels Wilderness in 1980 and it now has a total of 16,566 acres. Mount Sneffels, a 14,150-foot intrusion of igneous rock on the eastern verge of this area, stands higher than any other point in the Wilderness. Members of the Hayden Survey purportedly named the peak after the Icelandic mountain in Jules Verne's " Journey to the Center of the Earth." Sneffels is the Nordic word for snowfield. Westward stretches a sheer vertical world of sharp ridges, icy slopes, and ragged peaks. It makes for dangerous climbing typical of the San Juan Mountains, sometimes called America's Switzerland, a land of unsurpassed mountain drama. Technical climbers are still discovering new routes here, but loose volcanic rock often moves the rating from "dangerous" to "very dangerous." In early fall, when light dustings of snow highlight the jagged terrain and the aspens have turned gold, you'll encounter an absolutely indescribable world of wonder. Fifteen miles of trail, in the eastern and western portions, access some of the finest midsummer wildflower spectacles on the planet, especially in Yankee Boy Basin just outside the eastern boundary, where you'll find the Blue Lakes Trail leading into the area for about 3.5 miles. The only lakes around, Blue Lakes huddle below the western flank of Mount Sneffels in a deep basin. The forbidding central region of the area is rugged beyond words and relatively seldom explored. 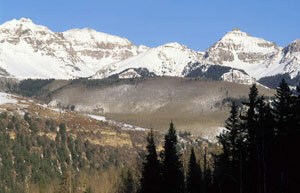 Planning to Visit the Mount Sneffels Wilderness? How to follow the seven standard Leave No Trace principles differs in different parts of the country (desert vs. Rocky Mountains). Click on any of the principles listed below to learn more about how they apply in the Mount Sneffels Wilderness.